NAHA, Japan - The Okinawa prefectural assembly on Thursday unanimously adopted a resolution demanding the suspension of flights and drills of U.S. military aircraft over schools and hospitals after a window fell from an American helicopter onto school grounds last week. The resolution of protest against the incident said, "No more threat to the lives of people in Okinawa should be tolerated," after the window fell from a CH-53E transport helicopter onto the playground of an elementary school adjacent to U.S. Marine Corps Air Station Futenma in the city of Ginowan. A slew of similar resolutions have been adopted by municipal assemblies in the southern island prefecture, protesting the accident that saw the roughly 90-square-centimeter metal-framed window weighing 7.7 kilograms drop into the playground of Futenma Daini elementary school, while 54 pupils were participating in physical education activities. In the resolution and a statement sent to Prime Minister Shinzo Abe and U.S. Ambassador to Japan William Hagerty, the assembly pointed out that accidents have frequently occurred in the prefecture, including a crash-landing in October of a CH-53E chopper that caught fire on privately owned land in the village of Higashi, near a U.S. military training area. The assembly noted, "A feeling of distrust is mounting among Okinawa people as these incidents vividly illustrate that the U.S. military's measures to prevent similar accidents are not functioning." The local council also demanded that the Japanese government keep a promise made between Abe and former Okinawa Gov. Hirokazu Nakaima to stop the operation of the Futenma air base by February 2019. 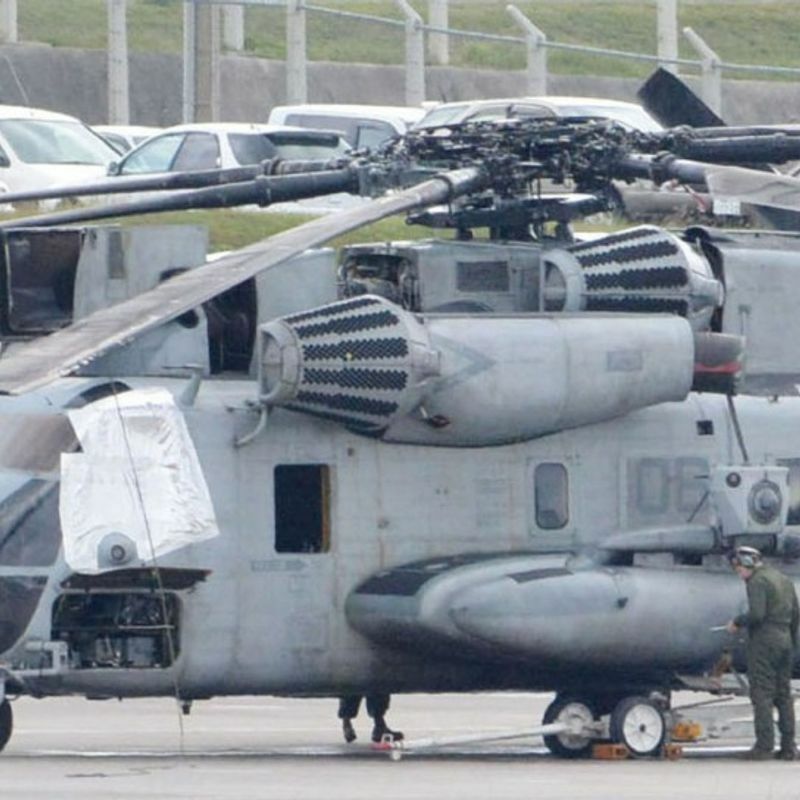 Following the window incident, the U.S. military resumed flights of CH-53E helicopters on Tuesday afternoon, saying the incident was caused by human error, not mechanical problems. The Japanese government gave the green light to the decision.